At 34 he gave his I Have a Dream speech. He won the Nobel Peace Prize at 35. At 39, he was assassinated. But today we celebrate his life and try to remember what he stood for. Revelations. The fountain in Moscone Center dedicated to the memory of Martin Luther King, Jr.
Now there is a final reason I think that Jesus says, "Love your enemies." It is this: that love has within it a redemptive power. And there is a power there that eventually transforms individuals. Just keep being friendly to that person. Just keep loving them and they can't stand it too long. Oh, they react in many ways in the beginning. They react with guilt feelings and sometimes they'll hate you a little more at that transition period, but just keep loving them. And by the power of your love they will break down under the load. That's love, you see. It is redemptive and this is why Jesus says love. There's something about love that builds up and is creative. There is something about hate that tears down and is destructive. So love your enemies. 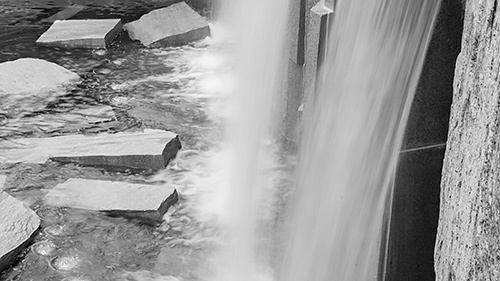 You look at the rock and the water in our photo from Revelations, the fountain honoring Dr. King, and you think that water has no sway over that rock. It splashes right off the surface. But then you remember how the Grand Canyon was carved by the Colorado River and you wonder if water isn't, in the long run, stronger than rock. And if love, in the long run, isn't stronger than the fears that drive us mad.